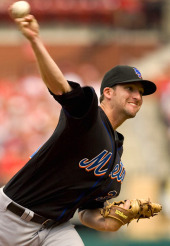 In college, Bobby Parnell was a shortstop converted to relief pitcher. After being drafted by the Mets, he was a reliever converted to a starter. After opening eyes in spring training with a 97-MPH fastball, he was converted from starter back to relief. By the first week of August, he was converted from reliever back to starter. And before the season closed, Bobby was back in the bullpen. The Mets have jerked around young pitchers before — Aaron Heilman and Grant Roberts are the more prominent recent examples that come to mind — and their inability to make a decision one way or the other regarding Parnell is a symbol of the organization as a whole. It seems no one has the chutzpah to take a stand and stay the course, in any area of the franchise. But back to Parnell. We know that he can touch triple digits when used as a 15-20-pitch-at-a-time reliever. We also know that his velocity drops dramatically when used as a starter. Regardless of his role, his fastball often has heavy sink, though it just as often sits flat and high in the middle of the strike zone. He has no offspeed pitch to speak of, but he does throw a slider that is deadly about 20% of the time. In his first professional season as a relief pitcher, Parnell showed flashes of brilliance but overall was inconsistent. Lack of command was a major issue, as was the inability to rely on secondary stuff. Once batters realized all he could get over the plate was the fastball, they sat on it. Inexplicably, the Mets moved Parnell to the starting rotation after failing in the bullpen. Generally speaking, a pitcher who fails in relief because of a deficiency in repertoire will get slaughtered as a starter, so it was no surprise to anyone (other than the Mets brass) that the “experiment” was a colossal failure. What was more concerning was the fact that Parnell went from throwing 15-20 pitches per outing, 3-4 times per week, to throwing 80-100 pitches once every five days — in the course of two weeks. Where did the Mets come up with that accelerated plan of “stretching him out”, and what was the rush, considering that the team was well out of the race by late July? The quick conversion seemed incongruent with the philosophy of a team that has been so conservative in regard to pitch counts — particularly with young pitchers. It’s interesting that so much buzz surrounded the Yankees’ conservative approach to Joba Chamberlain’s transformation from reliever to starter, yet almost no one questioned the Mets’ handling of Parnell. Few would have faulted the Mets for treating a 100-MPH thrower with kid gloves. In any case, the bottom line is that Parnell did not establish himself as competent in either role — though some of the blame could go to the way he was handled. It’s clear he has dominating velocity, but it’s also clear he needs more time to develop. The question is, will it be more beneficial for Parnell to pitch as a starter, or to focus on relief? It’s not impossible for a 25-year-old to learn a “plus” secondary pitch, but it’s not easy, either — and without one, starting is out of the question. Right now, Parnell is stuck n a spot from where people like Joselo Diaz, Marcos Carvajal, and Lino Urdaneta never advanced. He may remain there, or he could evolve into a Matt Lindstrom (valuable reliever throwing heat for an inning at a time) or a Mike Pelfrey (enigmatic starter throwing two pitches at similar speeds in the low- to mid-90s). Which way he goes is anyone’s guess, and the Mets seem as clueless as the rest of us. Next Is MLB Killing Its Future Fan Base? I think that Parnell is better suited to relief, but you’re right — the Mets need to decide on a role for him and let him develop. Hear hear. Intelligent analysis that has been well written. Where does the Mets FO go from here? Sad really. I’ve been of the opinion from the start that the Mets should have treated Bobby as a high caliber reliever and developed him as such. Why go shopping for closers when you’ve got someone in your system who has the chops? In fairness to the Mets, however, they were left with VERY few options in the starter role by the last third of this season. I’d like to see Bobby in a position where he can throw triple digits every couple of days or so rather than 92 every 5th day. He’s Jonathan Papelbon minus the d***hebaggery. Papelbon? Let’s not go crazy. Agreed. We could have a Jon papelbon lite. Lost in analysis is that BP was soooo much better at the end of the season. i think the starting experiment stretched his arm out and may even have taught him a little about using his pitches. Again, I am one who believes we should deal Krod (at his peak value) and possibly retool the Bullpen. Green, Feliciano and Bobby would be in my pen, possibly adding Saito. I might add wagner (if compensation is right), or another closer type. I’d be looking for young arms for Krod. I LIKE THAT THOUGHT! It is sensible and bold. Which of course means the the Mets will never do it. Problem is Krod had a 6.75 2nd half ERA and is due to make $23-mil over the next 2 years with an option in 2012 for $17.5-mil or a $3.5-mil buyout. So I’m not sure if his value at the moment really is at its peak, and I’m not sure the Mets would really get much in return for a cascading player who is going to be making a lot of dough. I’d love to see Krod traded too, but I don’t think this offseason is the ideal time. Dude: In this discussion (add the Putz post) we have described a 7 man trade for JJ Putz…an injured Putz at that. -Add to that at least half of the contenders/pretenders would love to have Krod in their pen. It may not happen but I am obviously not alone in thinking it should. Heck…looks like the Angels could use him. – PLUS as Joe discusses if the Mets even consider picking up Putz’s option it has to be because they move Krod and think Putz could come back ‘healthy’ and give them value either in trade or in the Mets pen. -I’d propose adding Saito, Wagner and/or another FA closer of the medium risk lower cost (lower than Krod) variety. A beautiful move by the Mets would be trading K-Rod and then signing Wagner — and in turn losing a 2nd-round pick. But at least they’d have Chris Carter to wow the fans in Buffalo.